Somewhat unexpectedly, a blog post that I wrote last week caught fire internationally. 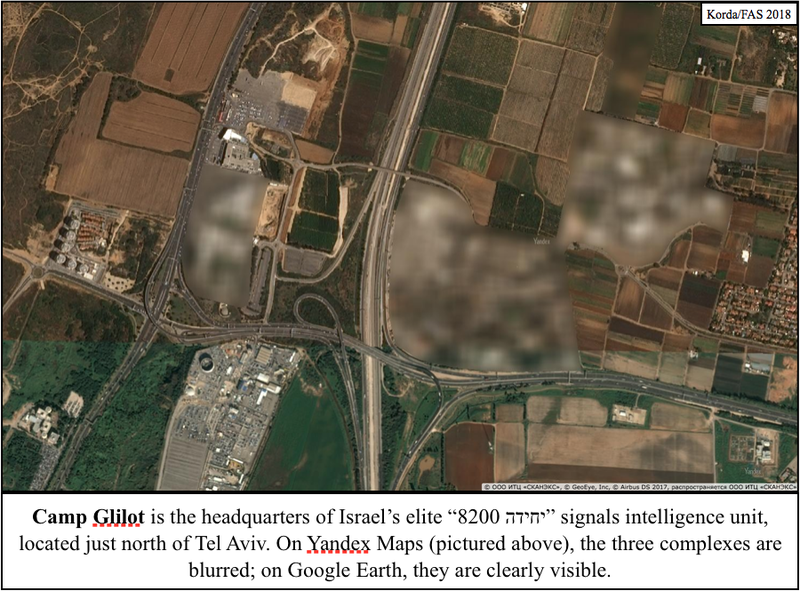 On Monday, I reported that Yandex Maps—Russia’s equivalent to Google Maps—had inadvertently revealed over 300 military and political facilities in Turkey and Israel by attempting to blur them out. In a strange turn of events, the fallout from that story has actually produced a whole new one. The “national public map” to which Yandex refers is the official online map of Israel which is maintained by the Israeli Mapping Centre (מרכז למיפוי ישראל) within the Israeli government. Since Yandex claims to take its cue from this map, I wondered whether that meant that the Israeli government was also selectively obscuring sites on its national map. I wasn’t wrong. In fact, the Israeli government goes well beyond just blurring things out. They’re actually deleting entire facilities from the map—and quite messily, at that. Usually, these sites are replaced with patches of fake farmland or desert, but sometimes they’re simply painted over with white or black splotches. 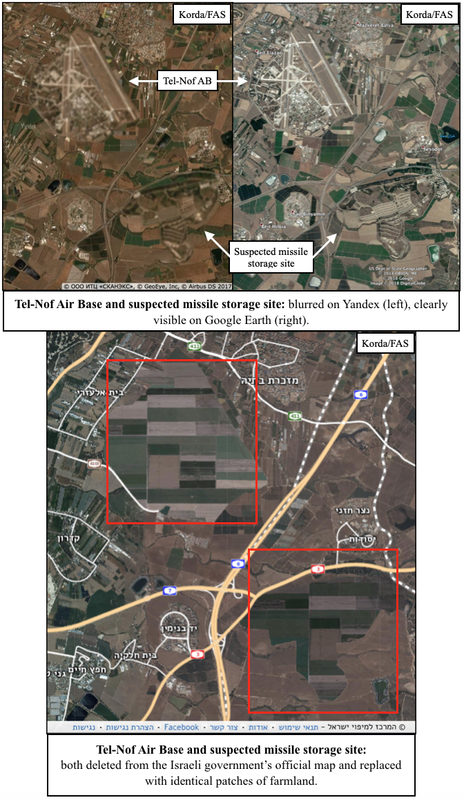 Tel-Nof Air Base is just down the road from a suspected missile storage site, both of which have been painted over with identical patches of farmland. 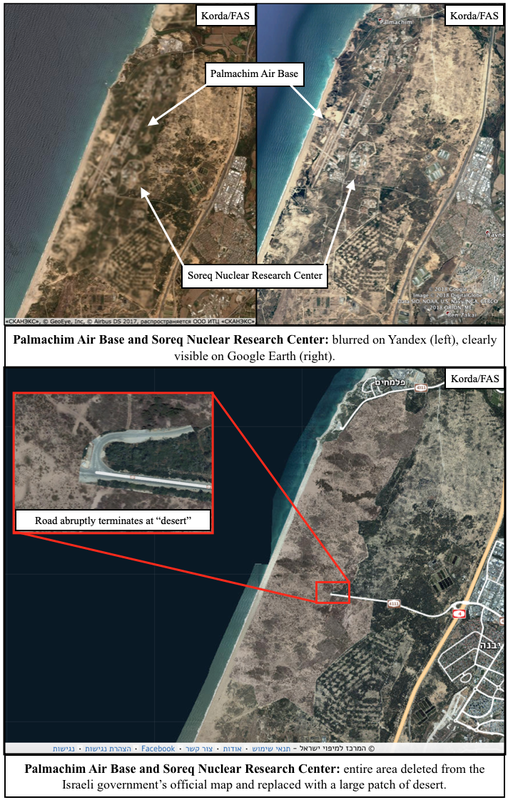 Palmachim Air Base doubles as a test launch site for Jericho missiles and is collocated with the Soreq Nuclear Research Center, which is rumoured to be responsible for nuclear weapons research and design. The entire area has been replaced with a fake desert. The Haifa Naval Base includes pens for submarines that are rumoured to be nuclear-capable, and is entirely blacked out on the official map. 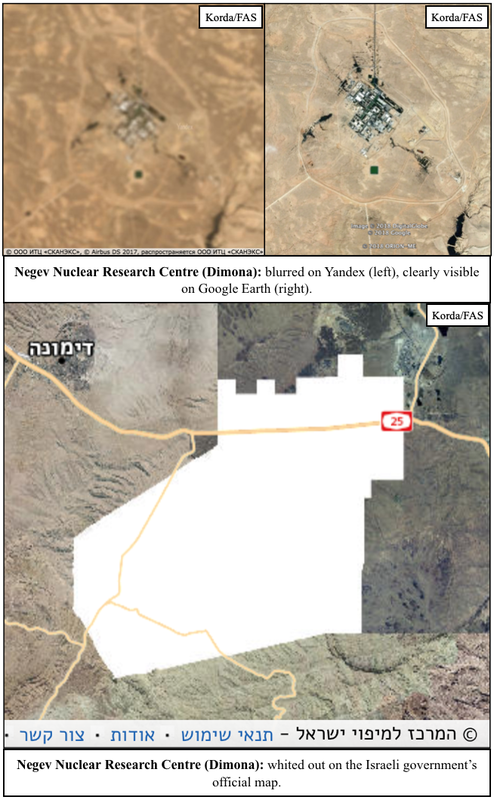 The Negev Nuclear Research Center at Dimona is responsible for plutonium and tritium production for Israel’s nuclear weapons program, and has been entirely whited out on the official map. Hatzerim Air Base has no known connection to Israel’s nuclear weapons program; however, the sloppy method that was used to mask its existence (by basically just copy-pasting a highly-distinctive and differently-coloured patch of desert to an area only five kilometres away) was too good to leave out. Given that all of these locations are easily visible through Google Earth and other mapping platforms, Israel’s official map is a prime example of needless censorship. 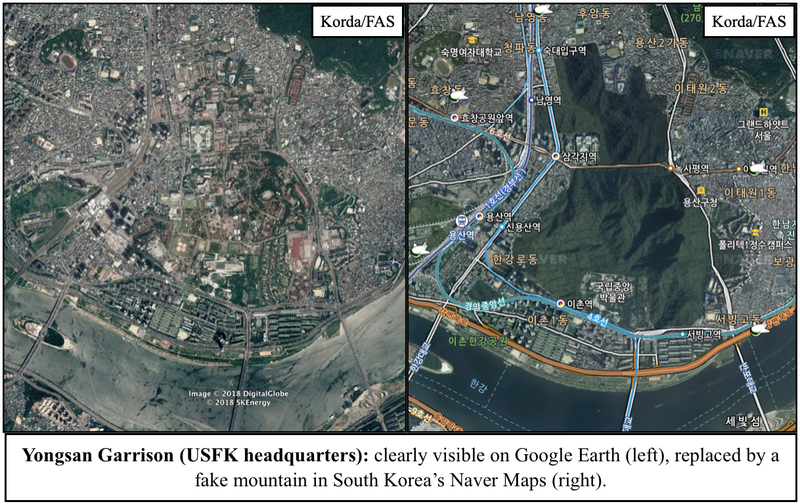 But Israel isn’t the only one guilty of silly secrecy: South Korea’s Naver Maps regularly paints over sensitive sites with fake mountains or digital trees, and in a particularly egregious case, the Belgian Ministry of Defense is actually suing Google for not complying with its requests to blur out its military facilities. Before the proliferation of high-resolution satellite imagery, obscuring aerial photos of military facilities was certainly an effective method for states to safeguard their sensitive data. However, now that anyone with an internet connection can freely access these images, it simply makes no sense to persist with these unnecessary censorship practices–especially since these methods can often backfire and draw attention to the exact sites that they’re supposed to be hiding. 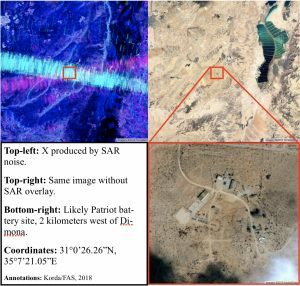 Case studies like Yandex and Strava—in which the locations of secret military facilities were revealed through the publication of fitness heat-maps—should prompt governments to recognize that their data is becoming increasingly accessible through open-source methods. Correspondingly, they should take the relevant steps to secure information that is absolutely critical to national security, and be much more publicly transparent with information that is not—hopefully doing away with needless censorship in the process. 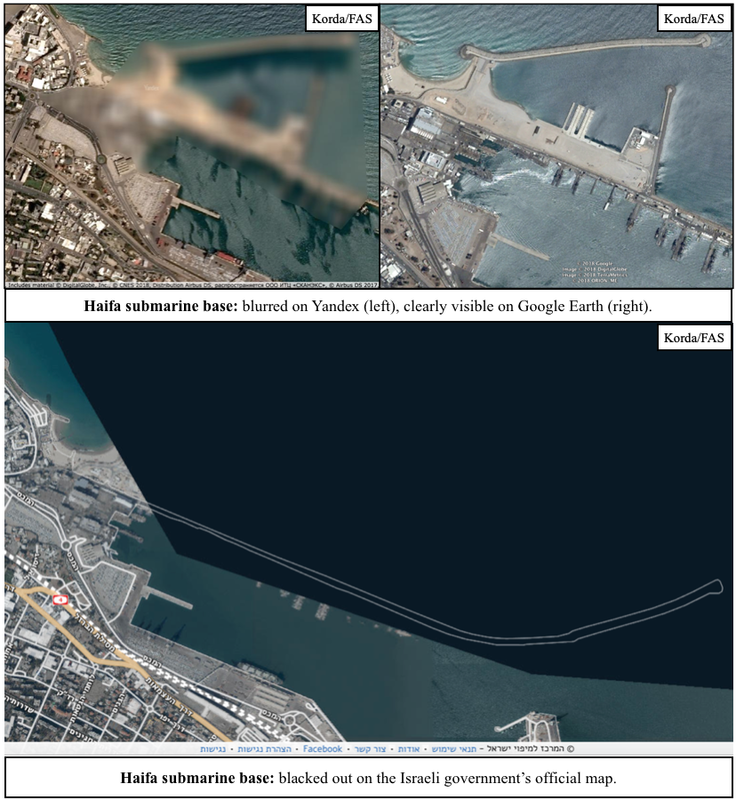 Want to know how to make a satellite imagery analyst instantly curious about something? Google Earth occasionally does this at the request of governments that want to keep prying eyes away from some of their more sensitive military or political sites. France, for example, has asked Google to obscure all imagery of its prisons after a French gangster successfully conducted a Hollywood-inspired jailbreak involving drones, smoke bombs, and a stolen helicopter(! )—and Google has agreed to comply by the end of 2018. In similar fashion, an old Dutch law requires Dutch companies to blur their satellite images of military and royal facilities—even to the point where a satellite imagery provider once doctored an image of Volkel Air Base after it was purchased by FAS’ very own Hans Kristensen. 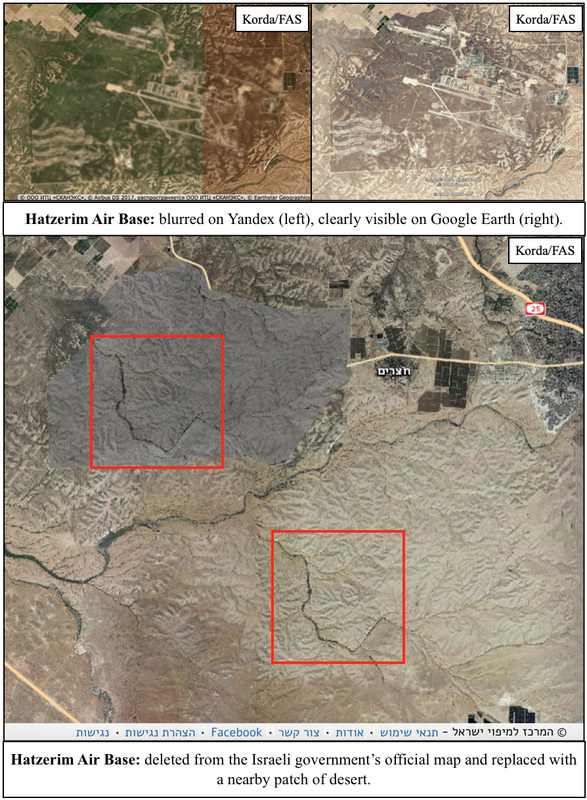 Yandex Maps—Russia’s foremost mapping service—has also agreed to selectively blur out specific sites beyond recognition; however, it has done so for just two countries: Israel and Turkey. The areas of these blurred sites range from large complexes—such as airfields or munitions storage bunkers—to small, nondescript buildings within city blocks. 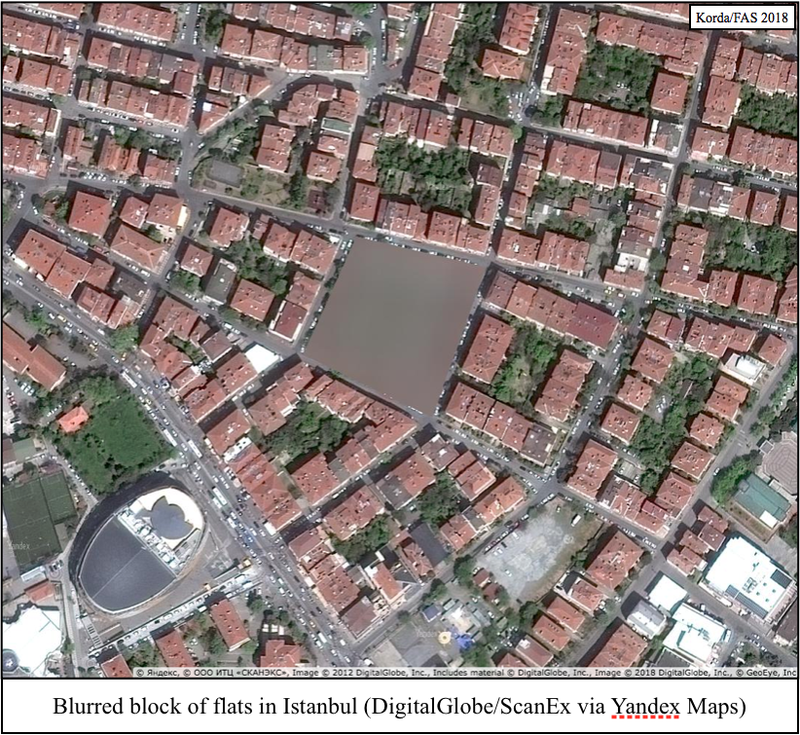 Although blurring out specific sites is certainly unusual, it is not uncommon for satellite imagery companies to downgrade the resolution of certain sets of imagery before releasing them to viewing platforms like Yandex or Google Earth; in fact, if you trawl around the globe using these platforms, you’ll notice that different locations will be rendered in a variety of resolutions. Downtown Toronto, for example, is always visible at an extremely high resolution; looking closely, you can spot my bike parked outside my old apartment. By contrast, imagery of downtown Jerusalem is always significantly blurrier; you can just barely make out cars parked on the side of the road. As I explained in my previous piece about geolocating Israeli Patriot batteries, a 1997 US law known as the Kyl-Bingaman Amendment (KBA) prohibits US companies from publishing satellite imagery of Israel at a Ground Sampling Distance lower than what is commercially available. 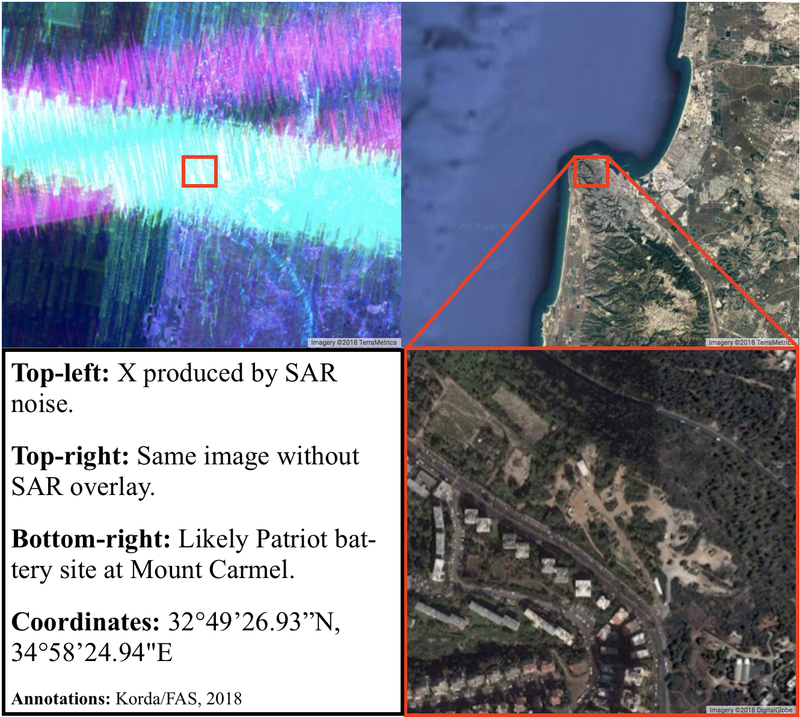 This generally means that US-based satellite companies like DigitalGlobe and viewing platforms like Google Earth won’t publish any images of Israel that are better than 2m resolution. 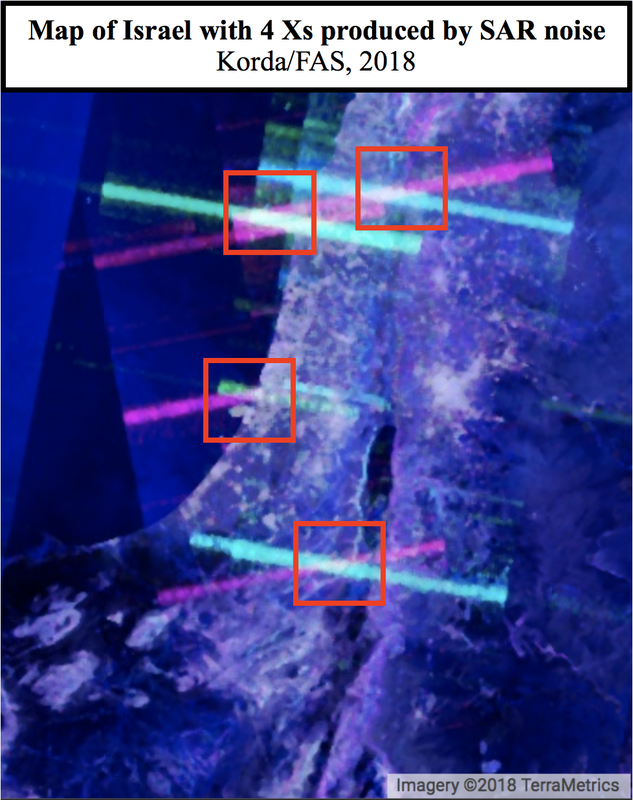 Foreign mapping services like Russia’s Yandex are legally not subject to the KBA, but they tend to stick to the 2m resolution rule regardless, likely for two reasons. Firstly, after 20 years the KBA standard has become somewhat institutionalized within the satellite imagery industry. And secondly, Russian companies (and the Russian state) are surely wary of doing anything to sour Russia’s critical relationship with Israel. 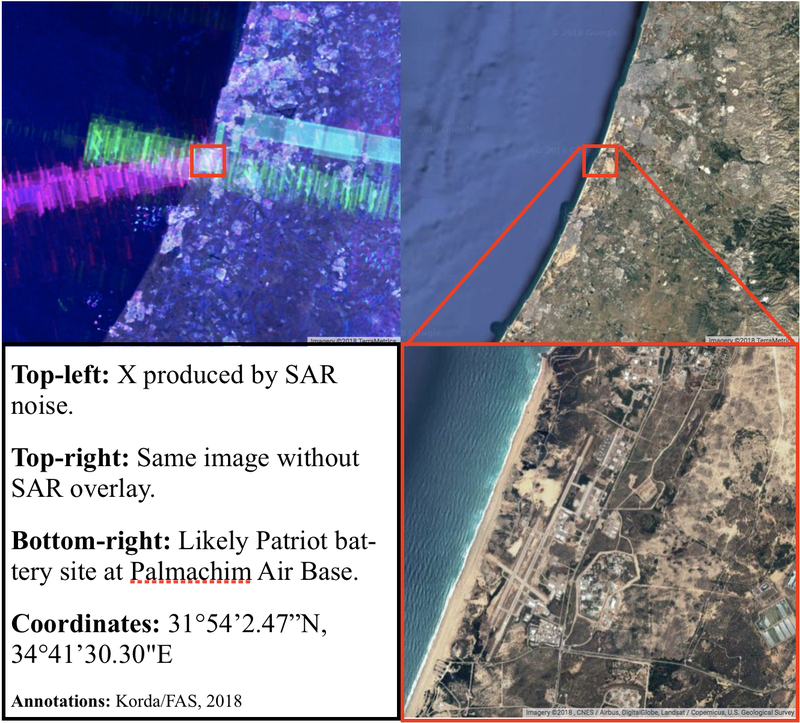 However, Yandex has taken a step well beyond simply downgrading its Israeli imagery, as is typical for most mapping services. 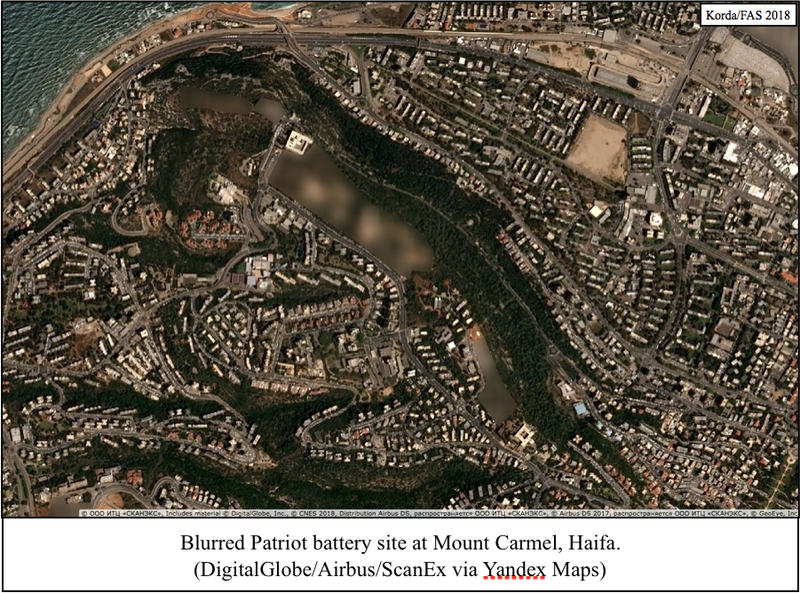 Yandex itself—or perhaps its imagery provider ScanEx—has blurred out specific military installations in their entirety. Interestingly, it has done the same to Turkey, a country that benefits from no special standards and is therefore almost always shown in very high resolution. This blurring is almost certainly the result of requests from both Israel and Turkey; it seems highly unlikely that a Russian company would undertake such a time-consuming task of its own volition. Fortunately (from an OSINT perspective), this has had the unintended effect of revealing the location and exact perimeter of every significant military facility within both countries, if one is obsessive curious enough to sift through the entire map looking for blurry patches. Matching the blurred sites to un-blurred (albeit downgraded) imagery available through Google Earth is a method of “tipping and cueing,” in which one dataset is used to inform a more detailed analysis of a second dataset. Included in the list of Yandex’s blurred sites are at least two NATO facilities: Allied Land Command (LANDCOM) in Izmir, and Incirlik Air Base, which hosts the largest contingent of US B61 nuclear gravity bombs at any single NATO base. Strangely, no Russian facilities have been blurred—including its nuclear facilities, submarine bases, air bases, launch sites, or numerous foreign military bases in Eastern Europe, Central Asia, or the Middle East. Although none of Russia’s permanent military installations in Syria have been blurred, almost the entirety of Syria is depicted in extremely low resolution, making it nearly impossible to utilize Yandex for analyses of Syrian imagery. By contrast, both Crimea and the entire Donbass region are visible at very high resolutions, so this blurring standard applies only selectively to Russia’s foreign adventures. 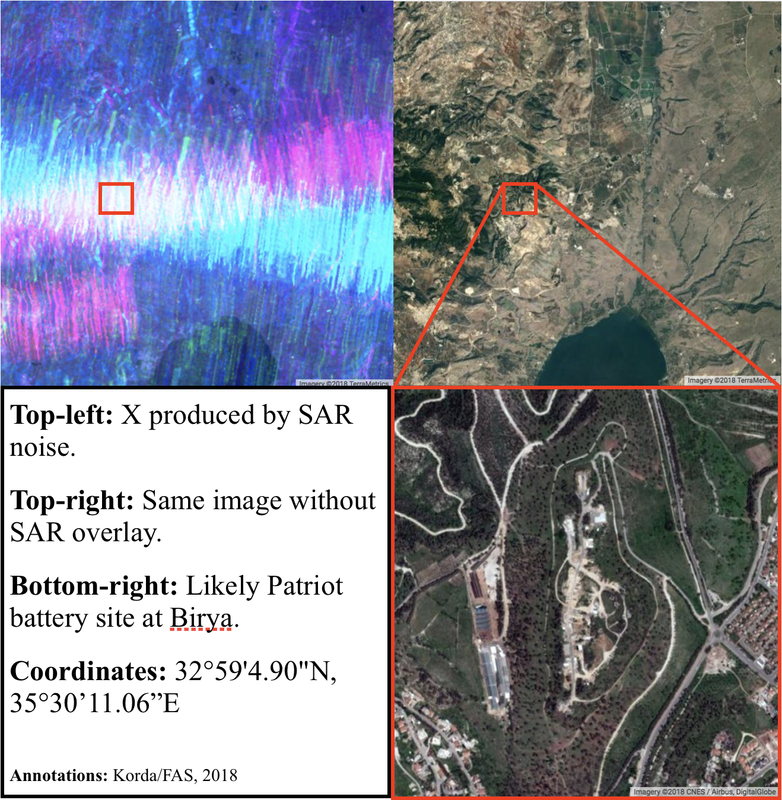 All four Israeli Patriot batteries that I identified using radar interference in my previous post have been blurred out, confirming that these sites do indeed have a military function. Putting aside the geopolitical intrigue of Russia’s relations with both Israel and Turkey, Yandex’s actions are a prime example of what is known as the Streisand Effect. In 2003, Barbra Streisand attempted to sue a photographer who posted photos of her Malibu mansion online, claiming $10 million in damages and demanding that the innocuous photo be taken down. Her actions completely backfired: not only did Streisand lose the case and have to cover the defendant’s legal fees, but the attention raised by her lawsuit directed significant traffic to the photo in question. Before the lawsuit, the photo had only been viewed six times (including twice by Streisand’s lawyers); a month later, the photo had accumulated over 420,000 views—a prime example of how attempting to obscure something is actually likely to result in unwanted attention. So too with Yandex. 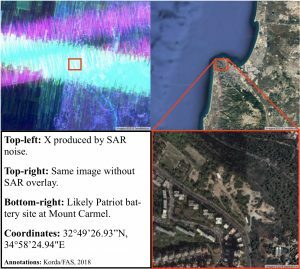 By complying with requests to selectively obscure military facilities, the mapping service has actually revealed their precise locations, perimeters, and potential function to anyone curious enough to find them all. I was reading through the latest Stockpile Stewardship and Management Plan from the National Nuclear Security Administration (NNSA) and wondering what I should pick to critique the Obama administration’s nuclear policy. – Why NNSA continues to overspend and over-commit and create a spending bow wave in 2021-2026 in excess of the President’s budget in exactly the same time period that excessive Air Force and Navy modernization programs are expected to put the greatest pressure on defense spending? – Why a smaller and smaller nuclear weapons stockpile with fewer warhead types appears to be getting more and more expensive to maintain? – Why each warhead life-extension program is getting ever more ambitious and expensive with no apparent end in sight? – And why a policy of reductions, no new nuclear weapons, no pursuit of new military missions or new capabilities for nuclear weapons, restraint, a pledge to “put an end to Cold War thinking,” and the goal of disarmament, instead became a blueprint for nuclear overreach with record funding, across-the-board modernizations, unprecedented warhead modifications, increasing weapons accuracy and effectiveness, reaffirmation of a Triad and non-strategic nuclear weapons, continuation of counterforce strategy, reaffirmation of the importance and salience of nuclear weapons, and an open-ended commitment to retain nuclear weapons further into the future than they have existed so far? What About The Other Nuclear-Armed States? Despite the contradictions and flaws of the administration’s nuclear policy, however, imagine if the other nuclear-armed states also published summaries of their nuclear weapons plans. Some do disclose a little, but they could do much more. For others, however, the thought of disclosing any information about the size and composition of their nuclear arsenal seems so alien that it is almost inconceivable. Yet that is actually one of the reasons why it is necessary to continue to work for greater (or sufficient) transparency in nuclear forces. Some nuclear-armed states believe their security depends on complete or near-compete nuclear secrecy. And, of course, some nuclear information must be protected from disclosure. But the problem with excessive secrecy is that it tends to fuel uncertainty, rumors, suspicion, exaggerations, mistrust, and worst-case assumptions in other nuclear-armed states – reactions that cause them to shape their own nuclear forces and strategies in ways that undermine security for all. Nuclear-armed states must find a balance between legitimate secrecy and transparency. This can take a long time and it may not necessarily be the same from country to country. The United States also used to keep much more nuclear information secret and there are many institutions that will always resist public access. But maximum responsible disclosure, it turns out, is not only necessary for a healthy public debate about nuclear policy, it is also necessary to communicate to allies and adversaries what that policy is about – and, equally important, to dispel rumors and misunderstandings about what the policy is not. Nuclear transparency is not just about pleasing the arms controllers – it is important for national security. Mordechai Vanunu, who revealed aspects of Israel’s nuclear weapons program to the press three decades ago and served a lengthy prison term as a result, is again entangled with Israeli legal authorities over the contents of a recent TV interview. See “Nuclear Whistle-blower Vanunu Arrested Over Channel 2 Interview,” Haaretz, September 10. Vanunu should be allowed to emigrate from Israel, as he has requested, wrote Charles D. Ferguson, president of the Federation of American Scientists, and Frank von Hippel of Princeton University. “We realize that Vanunu’s past actions are susceptible to different interpretations, including negative interpretations, and that he in fact violated the laws of the State of Israel. But the essential fact is that upon conviction he served his full sentence in prison, as he was required to do. Under the circumstances, we believe it is unjust for Israel to continue to punish him over and over for the same crime,” Ferguson and von Hippel wrote in an October 12 letter to the Government of Israel. Last week I was in New York to brief two panels at the Third Session of the Preparatory Committee for the 2015 Review Conference of the Parties to the Treaty on the Non-Proliferation of Nuclear Weapons (phew). The first panel was on “Current Status of Rebuilding and Modernizing the United States Warheads and Nuclear Weapons Complex,” an NGO side event organized on May 1st by the Alliance for Nuclear Accountability and the Women’s International League for Peace and Freedom (WILPF). While describing the U.S. programs, I got permission from the organizers to cover the modernization programs of all the nuclear-armed states. Quite a mouthful but it puts the U.S. efforts better in context and shows that nuclear weapon modernization is global challenge for the NPT. The second panel was on “The Future of the B61: Perspectives From the United States and Europe.” This GNO side event was organized by the Nuclear Age Peace Foundation on May 2nd. In my briefing I focused on providing factual information about the status and details of the B61 life-extension program, which more than a simple life-extension will produce the first guided, standoff nuclear bomb in the U.S. inventory, and significantly enhance NATO’s nuclear posture in Europe. The two NGO side events were two of dozens organized by NGOs, in addition to the more official side events organized by governments and international organizations. Yet in disclosing the size and history of its nuclear weapons stockpile and how many nuclear warheads have been dismantled each year, the United States has done something that no other nuclear-armed state has ever done, but all of them should do. Without such transparency, modernizations create mistrust, rumors, exaggerations, and worst-case planning that fuel larger-than-necessary defense spending and undermine everyone’s security. For the 185 non-nuclear weapon states that have signed on to the NPT and renounced nuclear weapons in return of the promise made by the five nuclear-weapons states party to the treaty (China, France, Russia, United Kingdom, and the United States) “to pursue negotiations in good faith on effective measures relating to the cessation of the nuclear arms race at early date and to nuclear disarmament,” endless modernization of the nuclear forces by those same five nuclear weapons-states obviously calls into question their intension to fulfill the promise they made 45 years ago. Some of the nuclear modernizations underway are officially described as intended to operate into the 2080s – further into the future than the NPT and the nuclear era have lasted so far.